I am pretty bad at trivia. But once in awhile I come through. Over the summer, our company had a Game Night at the office and we played Trivia Pursuit 90's Edition. I got a question about a technology that combines magnetic and optical technologies to store data. I stunned the crowd with the answer: Floptical. In case you don't remember Floptical technology, it was kinda like a floppy, but stored an amazing 21 MB of data on a single disc. Holy smokes, Batman! Slap in a SCSI card and with only an hour's worth of configuration, you've got a fast, fat backup! But Floptical technology was replaced in the mid-90's with Zip Disks. Zip Disks could hold 100 Mb of data. That meant you only needed TEN discs to hold a Gigabyte. In fact, they used to sell a ten-pack called a Giga-Pack. The ad on the right is from an eBay auction that ended Saturday, August 25th, 2012. But don't fear! There are other Zip Disk auctions going on right now, so you can still get yours. As you can imagine, it was not uncommon for people to use these technologies to back up their data. In fact, I knew someone whose job included two hours a day of swapping Floptical discs to back up a software development machine. Again: Not uncommon. Old technology is not uncommon. After all, we're in an industry that changes at a dizzying pace. Many people run to whatever's new. New monitors, new processors, new memory, new storage. But when it comes to backup, you need to be very careful. From the various backup articles (noted at the end of this), it is clear that we back up data for several reasons. Simple backups help us recover the file that disappeared yesterday. Better backups help us recover the files deleted six months ago. Thorough, well documented backups are the basis for a Disaster Recovery Plan. So think about it: Why do you do backups? The answer to your "Why" question will help you pick the right backup medium. I get a lot of grief from people because I have advocated tape backups for so long. Remember, I come from the world of mainframe and mini computers - IBM 370s, Amdahl 3090s and HP 3000s. Tape was and is king when perfect recovery is a requirement and not an option. But even tape is not perfect. Capacity speaks for itself. If you have a medium that stores 10Mb of data, you better be backing up a 386 computer with a 20 Mb hard drive! In the world of "big data," we don't expect a backup to fit on one disc or one tape. But in small business, the ideal is that a full backup will fit on one medium. When a backup starts going to a second tape or disc, you see failed and incomplete backups increase dramatically. That's because the user doesn't swap media. As simple as it is to change discs, you have exceeded the ease of use requirement for the client. Speed is another obvious variable. If a backup does not finish by 8:00 AM, it probably interferes with business operations. So you need a medium that will hold a full backup and you need the speed to complete that backup within the window allowed. Many of us kick off backups at 10 PM or 11 PM. When backups go long, we can start them earlier. But with small business, we find lots of owners and managers logged on at nine o'clock at night, so our window is pretty limited. But in the real world, how many clients (and consultants) have used the cheapest media available and the cheapest hardware to write it with? Maybe 90%? Maybe more? It's another example of the Paradox of Simplicity: I can create a CD. I can read it from another machine. Therefore, I have a good copy/backup. Well, there's good and there's good enough. If that cheap CD written with that cheap CD burner lasts five years, is that good enough? Form factor lifetime refers to the time period when you can expect to find the specific media and related hardware/software available for use in restoring data. Floptical technology had a very short lifespan. Zip disks had a longer lifespan, but are nonetheless hard to find today. Reel to reel tape may be perfectly capable of recovery, but you still need a tape player! DDS and various kinds of DLT/SLT tapes have enjoyed a very long lifetime. The key to their success has been a commitment to reading older tapes. A DDS5 drive will read a DDS4 tape even if it can't write to it. Cost is partially self-explanatory. There's the obvious cost of buying the hardware, software, and media. Then there are the hidden costs of operation and recovery. How much labor does it take to manage backups regularly? Note that reliability will have a significant effect on this. A less reliable system will require more labor . . . and probably be more expensive in the long run. The cost of recovering data could also be significant, especially if pieces of the system are obsolete. Ease of use is critical to success. Of course you need to be able to configure, monitor, and test backups. Likewise, you need to be able to restore data and entire systems as needed. When technology is new this is much easier than when it gets old. Restoring from old or obsolete backup systems can be extremely time consuming and expensive. And, most importantly, you have to be very careful not to damage the backup at any time. Remember Truth #4 from the Ten Core Truths About Computer Backups: You must absolutely master the backup technologies you sell and use. When you stumble across older technologies, you will need to come up to speed before you start messing with media. That involves one of the great rules of success: Slow down, get more done. If you start a sloppy recovery, you might end up repeating work, starting over, and wasting a lot of time. If you do something wrong, you might destroy backup data and mess up the recovery altogether. Systems that are easy to use are not necessarily lower quality or less effective. The easier a system is to use, the more effective it will be in the long run. Of course, all of these things are relative. You need to balance the variables. Custody and access to media have generally not been an important concern until remote backups and cloud services became popular. After all, whether you're backing up to Floptical discs, tapes, or hard drives, you maintain custody at all times or your backups are moved to and from a secure off site storage facility by a bonded agent. It's really only with cloud-based backups that we lose control of our data. If your data storage company violates your company or industry standards, moves a copy of your data out of the country, or simply doesn't document where your data are stored, you have no control over that. You may never know these things are happening. And when something goes wrong, you may have no recourse. I believe the horror stories on this point will continue to grow. The laws governing this technology are made by legislators who can't set up an external USB drive and disputes are settled by judges who have their emails printed out by secretaries and placed in their in-box each morning. Talk about the wild west! The point here is that Cloud Backups may be the ultimate backup in terms of flexibility, reliability, timeliness, etc. - But you have to address the issues of custody and access to data more seriously than ever before. In an ever-changing world, how do you decide which technology to invest in? To answer that question, you need to define the kind of backups and archiving you need. For many businesses, the longest you will ever have to worry about a financial audit is seven years. In some industries, you're required to keep records for ten, twenty, or more years. Some records need to be maintained for the lifetime of the patient. Some records need to be retained forever. You need a process and technology to fit your needs. If all of this data exists as "live" data in some format, then you can continually modify your backup systems, never letting the current system become obsolete. At some point, you might add an entire archive of data to the "live" data, thus guaranteeing that that archive will always be included in the current backup. That takes a lot of disc space and time, so you'll need to balance cost and time requirements. More and more industries are requiring lengthy or permanent backups of specific data. Just make sure that you are an informed adviser to your clients. Make sure they understand that all of this takes money. And then proceed to design, build, and maintain systems that are as reliable as needed for as long as needed. Again, you're balancing all of the factors discussed. Tape is finally fading within small businesses due to cost and speed. And, to be honest, many technicians have never made the effort to master SCSI technology and tape backups (those used to be tied to one another). At this time, various kinds of disc-based backups are in play. Most of them are great for simple backups. But for longer-range backups, they are as expensive as tapes because the media need to be taken out of circulation. Interestingly enough, most disc-based backup systems fail on several levels with regard to creating fast, reliable backups with significant restore points. They are easy to use, but not great at creating reliable backups or disaster recovery systems. Again, the Paradox of Simplicity. They're "good enough" for simple backups. But are they good enough for long-term archives and disaster recovery? I am afraid, for many reasons, that this period of disc-based backups will become an era of failed recoveries. Fifteen years from now, technology schools will teach the lessons of poor backup designs and point to this time period for lots of examples. Luckily, like Floptical drives, this era appears to be short-lived. I exclude from this discussion the well-designed disc-to-disc, disc-to-disc-to-tape, and disc-to-disc-to-cloud backup systems. Good systems of this kind tend to use SAN technology, redundant arrays, and high speed data lines. That necessarily puts them outside the budget constraints of most small businesses. Cloud backups - or disc-to-disc-to-cloud backups - appear to be the answer to many of the most difficult challenges of reliable backups with multiple restore points. Cloud backups have virtually unlimited capacity. Some systems have virtually unlimited versioning. Point-in-time snapshots have been a weakness, but that has more to do with personal habits than technology. A few good lawsuits will bring that behavior back in line. Just give it time. Speed is still a major concern for many cloud-based backup systems. But if you backup to disc on site and then backup from disc to cloud, speed becomes less relevant because the disc-to-disc piece is fast and can be completed overnight and then the cloud component can trickle up as needed. You still have bandwidth considerations, so cost can still play a big role. Is cloud backup the ultimate, perfect backup? No. It scores very well on many variables, but the variables are always a mix. Cloud backup certainly has capacity. Media lifetime is kind of irrelevant since the cloud storage company takes on the responsibility of making your data available. They have to worry about media, form factor, and media lifetime issues on their end. Your job is to choose the right vendor so you can feel comfortable that these things are being taken care of! Speed and cost are still significant variables. Microsoft seems to be betting the farm that Internet connectivity will be super-fast and super-cheap in order to make their plans work. But we're certainly not there yet. If you want simple file recovery, then there are many options. If you want versioning that goes back 12 months, you have fewer options and higher expenses. If you want true snapshots or images - not "snapshots" reconstructed from versions - then costs go way up and options are slim. In all of this, ease of use can be very deceptive. It's the ultimate Paradox of Simplicity: Anyone can create a backup to the cloud that makes them feel good and safe but provides no real security for the data. It seems so simple. And if you have very little technical knowlege, all the systems seem good and reliable. As a result, people are placing the entire future security of their businesses on technology that is often inappropriate for their needs. More than ever, businesses need good advisers to help them make the right decisions regarding backups. If that's you, please see Truth #4 again: You must absolutely master the backup technologies you sell and use. You need to have a philosophy about backups and disaster recovery. You need to have a "system" you prefer and sell. You need to train your team on YOUR way of building, maintaining, and testing backups. You can't be lazy about this. Every single time you build and sell a new server or storage system, you need to build and document the backup and recovery strategy that works best for THIS client and THIS data. This is the fourth article in the mini-series on backups. See Part 1: Defining Your Client Backup, Part 2: Backup Philosophies and Client Communication, and Part 3 - Backup Monitoring, Testing, and Management. Also see earlier articles on Documenting Backups and Daily Monitoring Procedures. Please join us October 11th in Las Vegas, NV for a special all-day training on Life After SBS. Price includes lunch, snacks, and drinks. 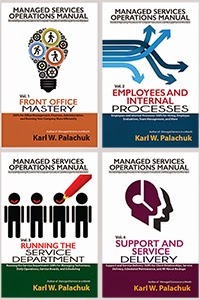 Live Seminar - One Day Only With Karl W. Palachuk (CEO Small Biz Thoughts, author, blogger) and Manuel Palachuk (CEO Conceptual Age Consulting, author, blogger). In addition to writing The Network Migration Workbook, we have worked together for seven years and developed some great "best practices" that are serving us well as we prepare for the SBS End of Life. This seminar is part of the SMB Nation Preday Events. SMB Nation's Fall Conference is October 12-14 at the Rio in Las Vegas. Early bird pricing is now in effect at http://fall.smbnation.com/. This event is not associated with SMB Nation itself, but we have worked with Harry for eight years to put on some kind of preday event. This year's topic is extremely timely and important: What do next! 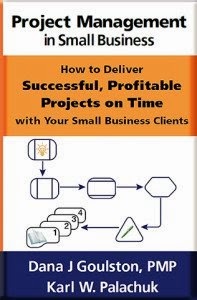 The clock is ticking on SBS and you need both a business plan and a technical process for moving from SBS to the Next Big Thing. 25% of this seminar will be on business model considerations for moving to stand-alone servers, cloud services, and hybrid combinations. 75% cover the technical click-by-click of moving to other services. And OF COURSE we'll show you how to do this with Zero Downtime. More details are at www.smbpreday.com. This is a $399 seminar - and we think you save WAY more than that with the first client you migrate off SBS. Do yourself a favor: Register today! Backups . . . OMG People . . . Test!